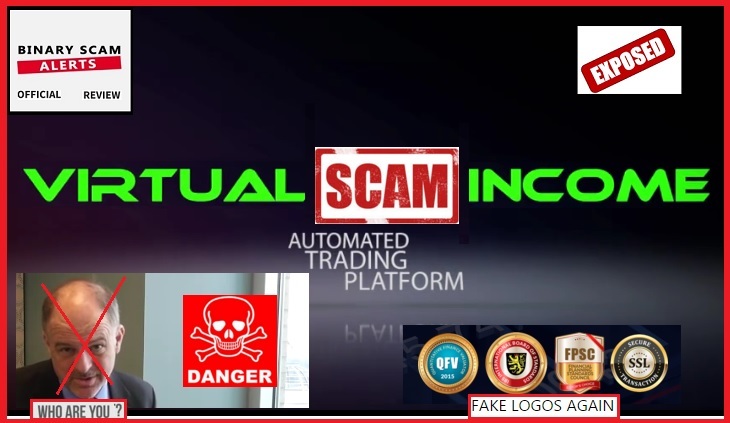 Binary Scam Alerts has decided to ignore direct threats from the Virtual Income Scam owners (AKA Virtual Income Incorporated Software, Autotrader, and APP) and is categorically declaring this system to be a class A SCAM. 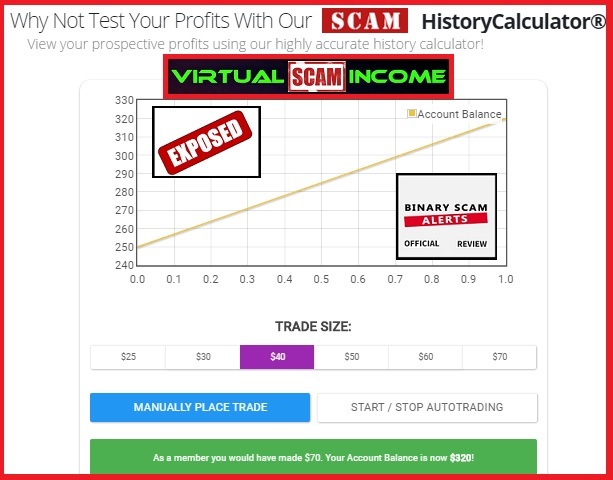 This means this software is not only inaccurate, it is also extremely deceitful, misleading, and will steal your money in a very effective and swift fashion. Still, for the sake of transparency and fairness our staff has thoroughly investigated and persistently pursued the real facts in order to validate its initial findings and conclusions. The most disturbing issue in our opinion has to do with the fact that the person who is selling you this fake app is in reality non-existent. He does not have a social profile of any kind, and his name and details are not divulged. These cheaters are trying to keep it a secret, and with good reason. Even the rip off artists behind the Amissio Formula who concocted their scam were smart enough to realize that people need a name to be attached to a human being who is selling them false dreams of prosperity and wealth. On a side note, these are the same people who have devised this malicious lie. It’s not every day we see such a robust sales page filled with all kinds of technological widgets. These people have come a long way and are now extremely masterful at using technology such as Java Script and PHP in order to create various charts and make-pretend historical calculators that are highly deceptive and lure innocent victims into registering with shady and unregulated brokers known as “deposit only” brokers. Again, we see the use of fake logos and credentials a recurring motif in these types of scams. If you were unlucky enough to invest with one of the recommended brokers, you will immediately realize something is wrong and the performance is not how it should be. That is the feeling you get when you start understanding that something is wrong and most likely you were scammed. So, it doesn’t really matter if you use trading strategies or technical analysis in the form of Candle Sticks or Bollinger Bands, and all the fancy charting tools in the world will not help you achieve a 90% ITM win rate. At this stage you would have received a phone call from the broker offering you an alternative trading strategy and a “real way” to make money. Don’t buy it, consider yourself lucky for only losing your initial investment amount and look at it as a lesson well-learned. Well yes, but you would need to fund a trading account with one of their recommended brokers. That will cost you at least $250. These include but are not restricted to My First Online Payday, Trade X Confidential, Limitless Profits, Trade Tracker Pro, the Amissio Formula, Tauribot, Citidel, Centument, Insured Profits with Dave and Ginny, Millionaire’s Blueprint, Binary Matrix Pro, Binary App 810, and The Free Money System with Walter Green. There is a sea of systems out there, and all of them will offer you amazing return on your investment. Unfortunately, only a few are true to their promise. 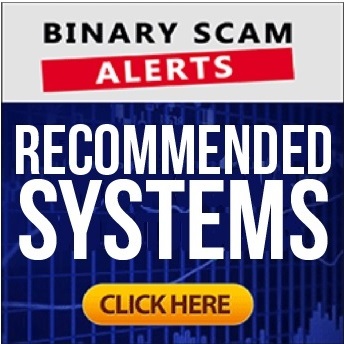 Binary Scam Alerts fully endorses the Binary Profit Method as the preferred signals tool. If you are interested in a solid Auto-trader with proven results, make sure to read our Virtnext review. The Virtual Income Software is a SCAM Autotrader and APP. It has all the makings of a highly deceptive and misleading system. We encourage our members and subscribers to seek alternative means of investment and avoid this software at all costs. As always, we invite you to join our Facebook group and Subscribe to our YouTube Channel.